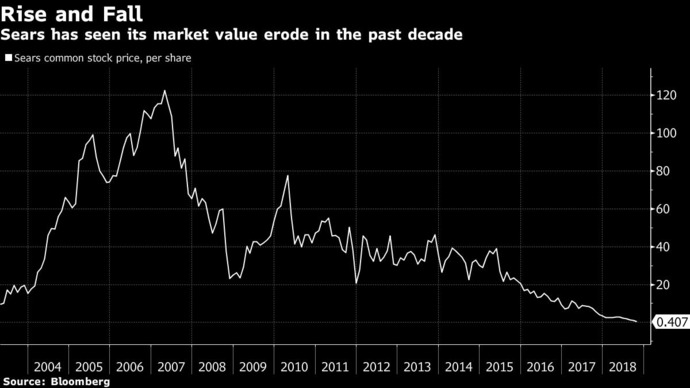 (Bloomberg) -- Sears Holdings Corp., the 125-year-old retailer known for its Kenmore and DieHard brands, collapsed into bankruptcy under pressure from too much debt and too few shoppers. The company filed for Chapter 11 protection from creditors with the U.S. Bankruptcy Court in White Plains, New York, listing more than $10 billion in debts and more than $1 billion in assets. Sears and its Kmart stores plan to stay in business with help from $600 million in new loans, but a turnaround plan outlined in a separate statement envisions Sears closing and selling dozens of stores, with Eddie Lampert, the biggest shareholder, stepping down immediately as chief executive officer. For now, Sears will be run by an Office of the CEO, and independent directors will oversee the restructuring. While Sears and Kmart stores and the online business will remain open, the company will shut 142 unprofitable outlets near the end of the year, on top of 46 unprofitable stores already slated for closure by November. Lampert, who remains chairman, acknowledged in the statement that turnaround efforts so far have fallen short. "While we have made progress, the plan has yet to deliver the results we have desired, and addressing the company's immediate liquidity needs has impacted our efforts to become a profitable and more competitive retailer," Lampert said. The company already has commitments for $300 million of debtor-in-possession financing from its senior secured asset-based revolving lenders, according to the statement, and it's negotiating a $300 million subordinated DIP financing with Lampert's hedge fund, ESL Investments Inc. ESL is also in discussions about buying "a large portion of the company's store base," Sears said. ESL held about $2.5 billion in Sears debt as of September, the result of multiple attempts to keep the chain afloat. The arrangements are still subject to court approval. The department-store chain once ranked as the biggest U.S. retailer, with a reputation built on its money-back guarantee of customer satisfaction. But it wasn't able to keep up with shifting consumer habits as online rivals siphoned off shoppers, and turnaround efforts were hobbled by mountains of debt. Since 2012, losses have topped $10 billion. The company that for years was called Sears, Roebuck & Co. became an American icon with its famous catalog, and the chain boomed in the decades after World War II along with a growing middle class. But Sears lost its footing in the 1980s with expansions into financial products such as banking, mortgages, insurance and credit cards, and Walmart Inc. supplanted Sears as the biggest retailer in the early 1990s. Lampert tried multiple strategies to revive Sears since using the Kmart chain to acquire Sears in 2005, sometimes with his own money. He's shuttered hundreds of money-losing stores, cut more than $1 billion in annual expenses, and spun off units such as Lands' End. Parts of Sears have already been through bankruptcy. Sears Canada Inc. liquidated a year ago and about 12,000 people lost their jobs. Lampert partially spun off the company from its parent in 2012 and was Sears Canada's biggest shareholder. The company was started by Richard Sears, a train station agent in Minnesota who began selling watches by mail in 1886, according to the company's website. He soon partnered with watch repairman Alvah Roebuck. The Sears catalog eventually sold products ranging from hardware and automobiles to kits for building an entire house. Sears opened its first store in 1925 in Chicago, and the Sears Tower in that city, now known as the Willis Tower, was the world's tallest building when it opened in 1973. The headquarters later moved to Hoffman Estates, Illinois.